Never let it be said that I was afraid to try new things. I like it. It picks up a lot of features that I wish were in screen — like the concept of panes, or being able to arrange a layout on startup. 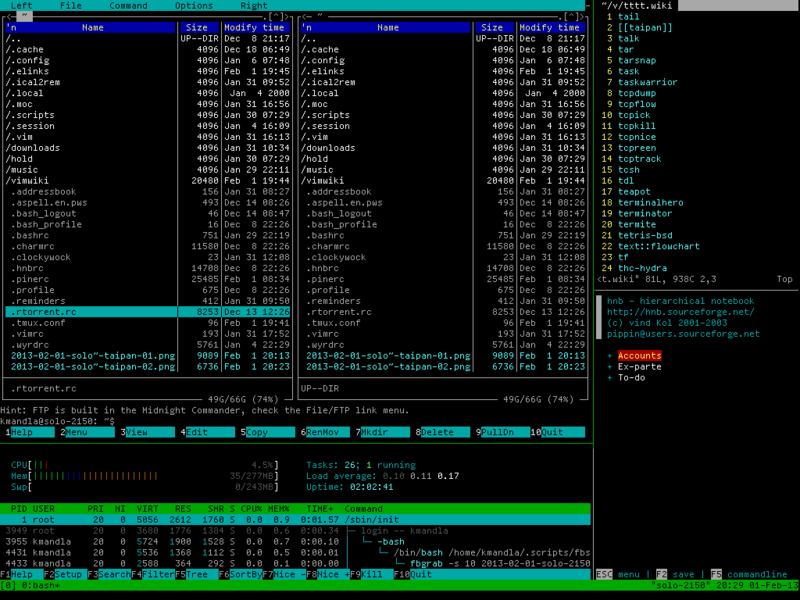 And switching between panes in tmux is far easier than screen’s tab cycles. Some of it is still a little shaky though. And I really wish there was something equivalent to screen’s idle option, but I can’t find one. This entry was posted in Linux and tagged screenshot on 2013/02/01 by K.Mandla. Lock the session (like the lock-session command) after number seconds of inactivity, or the entire server (all sessions) if the lock-server option is set. The default is not to lock (set to 0). Command to run when locking each client. The default is to run lock(1) with -np. I knew if I just asked the Internet, someone would tell me how to do it. Thanks, Don and Matt. I’ll see if I can get this to funnel through my ordinary screensaver scripts. Cheers! I am an enormous fan of Herbstluftwm so I think it is well worth a look. The use of bash makes it really easy to write hacky scripts to accomplish stuff, like piping window names to dmenu to make window switching easier. Good to see you’re finally ‘upgrading’ to tmux. Isn’t it nice to have a conf file that’s in plain English (rather than screen’s Klingon) for a change? You wouldn’t mind sharing any guides that you may have followed while learning how to use tmux, would you? Sure, but to be honest, I mostly stumbled around the man pages before settling on a default config that I liked.